So what is Stamped Concrete? Stamped concrete is concrete that is textured to resemble brick, slate, flagstone, stone, tile, wood, and other patterns. It is commonly used for patios, pools, sidewalks and driveways and other surfaces for residential and commercial applications. The natural ability of stamped concrete to resemble other building materials makes it a less expensive alternative, with minimal maintenance. 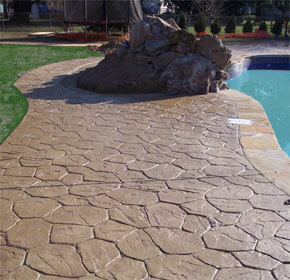 A combination of colors and special tools are used to permanently imprint newly placed concrete. Detailed brick, slate, flagstone, stone, tile, and even wood patterns can be simulated in a variety of colors and authentic looking textures at a fraction of the cost of comparable natural materials. It can be applied to almost any newly placed horizontal concrete surface. Complex designs incorporating steps, courtyards, and fountains can also be achieved. Stamped concrete can also be blended with other decorative concrete elements such as exposed aggregate finishes and acid-etch staining. The resulting finishes combine beauty and creativity with the economy, durability, and practicality of concrete. If you are looking for a practical, affordable way to transform your outdoors, call the professionals at Concrete By Design and get the experience in stamped concrete NJ residents have come to trust.